To Scrape By, The Poor In Spain Go Dumpster Diving Spain's slumping economy has sent thousands of people, many of them immigrants, scrounging in trash bins. Some scour the garbage for food, but many others are involved in a black-market trade for recycled materials. One scene has become increasingly common amid Spain's economic crisis: Thousands of people, many of them immigrants, are searching trash dumpsters by night. Some scour the garbage for food, but many others are involved in a black-market trade for recycled materials. 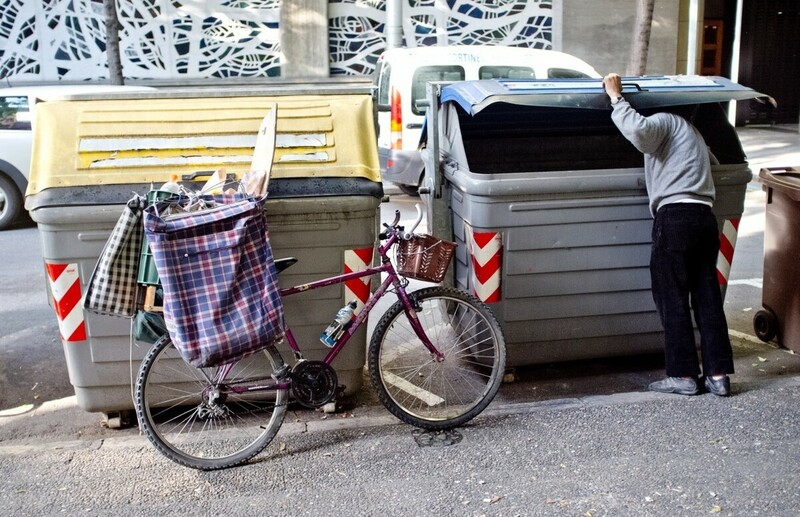 The scavengers have slowly become a sad fixture in many barrios across Spain, like the well-dressed, middle-aged man on a Barcelona street corner on a recent night. He averts his eyes from onlookers as he reaches his arm down deep into a dumpster. He's embarrassed, he says, that Spain's economy has left him searching through trash. He's afraid to give his name, but willing to tell his story: He's Pakistani, and came to Spain four years ago to work in construction — an industry that collapsed shortly after he arrived. Now, he's left scavenging. "Here, take a look at this," he says, describing what he's found. "This is junk metal, but it's worth a bit of money." Selling stuff like this, he says, is his only work now. "Look, over here there's some food," he says, lifting a few unbroken eggs out of a crate from a separate dumpster for organic waste. Although food can be useful, the man concentrates on looking for plastic cable or copper wire. He worked construction just long enough to make contacts with builders who, these days, are desperate for cheap materials. "See this? This is expensive," he says, showing off a cable. "But this other stuff over here, not as much. It's cheaper." As night falls, the man is joined by half a dozen other men, all searching the same cluster of containers labeled for trash or recyclables. The men describe a network of depots across the city. Iron goes for about 50 cents a pound, they say. Mohammed al-Awami, originally from Morocco, explains how things go on a really good night. "Let's say you're lucky, and you find a cafe that's having some construction work done," Al-Awami says. "And they need a big sheet of metal to cover the countertop. They might pay 80 euro cents a kilo. And they might buy up to 500 kilos, or at least 200. That's a lot of money for you!" Indeed. That's $200 to $500 for a single day's work. Even if that windfall comes just a few times a month, it adds up to more than Spain's monthly minimum wage. Al-Awami also used to work construction. Now he's one of what he estimates are 2,000 people searching dumpsters in downtown Barcelona every night. "I used to build new houses, do renovations and refurbish old historic homes. But now that industry has nearly disappeared," he says. These men say they're not homeless. Most Spaniards have access to unemployment benefits and food banks, if they need them. But the men searching this dumpster are mostly immigrants without family ties. Some may be in Spain illegally, and therefore have no access to welfare benefits that are still relatively generous, despite the government spending cuts. Economist Fernando Fernandez, with Madrid's IE Business School, says Spain had a poor underclass even in the boom years. But now it's swelling. "In any rich, developed economy there are pockets of need. It is probably true, too, that to some extent, this has increased," Fernandez says. "If anything, because the organizations caring for people in need are squeezed for resources." Al-Awami, the Moroccan immigrant, blames the housing market's collapse. His construction job was his livelihood, he says. Now he's joined the ranks of the unemployed, which tops 25 percent in Spain. "Now it seems so much of humanity is without work or anything," Al-Awami says. "So this is better than robbery, you know? Collecting scrap metal. You can even jump down into the dumpster, no problem." He smiles like he's showing off, and in an instant, he's head-first into the dumpster, with a friend holding his feet.